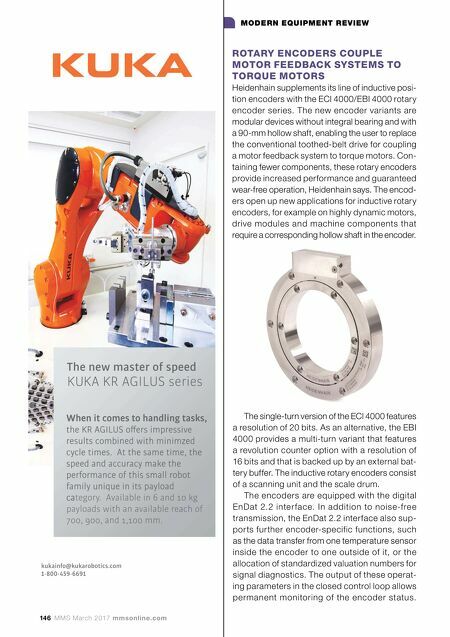 mmsonline.com March 2017 MMS 147 MODERN EQUIPMENT REVIEW The encoders' operating temperature ranges to m o r e t h a n 115° C . V i b r a t i o n r e s i s t a n c e i s 400 m/sec.² for the stator and 600 m/sec.² for the rotor. This ensures robustness as a motor feedback system—particularly when the motor is designed for high performance. Heidenhain Corp., call 800-219-0858 or visit heidenhain.us. 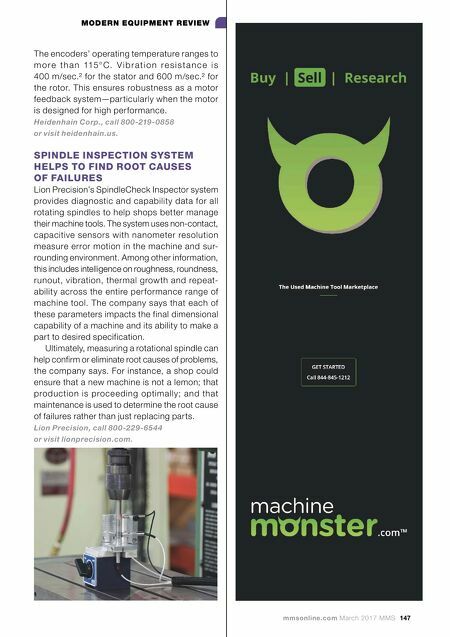 SPINDLE INSPECTION SYSTEM HELPS TO FIND ROOT CAUSES OF FAILURES Lion Precision's SpindleCheck Inspector system provides diagnostic and capability data for all rotating spindles to help shops better manage their machine tools. The system uses non-contact, capacitive sensors with nanometer resolution measure error motion in the machine and sur- rounding environment. Among other information, this includes intelligence on roughness, roundness, runout, vibration, thermal grow th and repeat- ability across the entire per formance range of machine tool. The company says that each of these parameters impacts the final dimensional capability of a machine and its ability to make a part to desired specification. Ultimately, measuring a rotational spindle can help confirm or eliminate root causes of problems, the company says. For instance, a shop could ensure that a new machine is not a lemon; that production is proceeding optimally; and that maintenance is used to determine the root cause of failures rather than just replacing parts. Lion Precision, call 800-229-6544 or visit lionprecision.com.